Smiles are always welcome! In May, I'm smiling just because it's MAY Yes, I AM... :)!! Fishing Report May 31, 2012 Jeff Sundin - On Wednesday, the weather finally broke into a new, friendlier pattern. A cool, morning breeze gave way to sunshine and calm seas during mid-day, and the recovery process started working it's will on the lake. When we began our day, it was 45 degrees and the surface temperature on the lake was 58 degrees. There was a slight chop on the surface from what was left of the East wind. By days end, we were looking at a surface temperatures in the 63 to 64 degree range and a light South wind had begun to tickle the lakes surface. For us, Walleye fishing started off fairly good in the morning, slowed during mid-day and then picked back up during the early evening. With calm seas and post cold front conditions, I thought it would be best if we stuck with the deep water pattern that's been working well during the past week or so. Fishing on mid-lake structures that topped off in the 18 to 20 foot range, we found small packs of fish in water depths of 24 to 27 feet. Like most recent days, if I could see fish on the Humminbird, we could catch them. But wherever we went, our first pass was almost always our best. Sometimes we'd get a second chance, but almost never a third. We stuck with the jig and minnow presentation, simple but effective, we used 1/4 ounce Lindy Jigs tipped with Shiners. There were times when the fish became somewhat aggressive, but the typical strike was very light and tentative. Teasing the fish onto the hook was a slow process and we did lose quite a few fish on their way to the boat. But if we played them out, the fish were coaxable and we caught enough of them to make it a good day. For today, calm seas and sunshine are going to force me to scrap my original plan. We'll only need a few Walleyes, so I might just play it safe, pick up a few and then head for a new lake. I'm hoping to stumble my way toward a school of Crappies or Sunfish. We'll see how the day goes. May 31, 2012 - Meanwhile back on Lake Winnie and Cutfoot Sioux, There were adventures of a different sort going on. Among a group of anglers visiting Bowen's; Noel McKibbin and his fishing partners Wayne and Gary were out on the lake, managing to find some action in the waves. Fishing for Walleyes was definitely on their agenda and acting on some good information, they headed out accross the river channel. The group was drifting the shallow breakline in Tamarack Bay using jigs and minnows, and they were having some fun too. They caught a half dozen Walleyes before they were paid a visit by an unexpected visitor ... Read >> Bowen Lodge Walleye fishing report . (5/31) Gus Sheker, Gus' Place Resort on Ball Club Lake; "Tough fishing conditions; rain, wind and cool temps did slow the traffic on the lake, but the fish haven't seemed to mind the surface conditions. All species are being caught at this time. Crappies, Blue Gills and Rock Bass are active along the East shoreline and going for minnows and bobbers in 4 to 6 feet. May is usually a bit early to see the Walleye falling for crank baits, but they are. Lindy rigged leeches have also been very effective in 10 to 15 feet. Despite the rough weather, we are seeing limits of Walleye. I have been saying this for awhile, but I will again;..... if you like to fish Perch, Ball Club Lake is producing many over 10 inches. The majority of the Perch class has finally grown up. Work Crawlers or Fat Heads in 4 to 10 feet along most any shoreline. Gus Sheker, Gus' Place Resort . (5/31) On Lake Winnie Robby Ott, Otters Guide Service, Robby Ott Fished Big Winnie on Monday. Robby said; "Our best success for Walleye was on some of the mid-lake humps on the North end." Best presentation was jig and minnow combination, using 1/4 ounce jigs tipped with a Spottail Shiner worked the best. That is until, those big West North West Rollers came through. When the waves got big, Robby was experimenting with a half a night crawler and having some success with those too. (5/31) In The Deer River Area, Brian Castellano wrote; "A buddy and I hit a local clear water lake during the day today as he had some walleye action out there the other day. After a while we got the itch to try something different so we headed towards a bay that "looked good" hoping to find some panfish. Water temps in the bay were 60-61 and lily pads were starting to emerge on top of the water. We found a decent but short lived crappie bite and ended up boating a limit w/ a couple throwbackers in that bunch. We also found the bluegills up shallow 1-2', as evidenced by this FAT shallow water 9" pumpkinseed. Fixed position bobbers and 1/32 oz pink head/white marabou jigs produced the panfish....no bait required....but it may have helped a bit. The majority of the panfish were holding on the edge of the newly emerging lilypads and there were a bunch more non-biters on the graph out in deeper water suspended. (5/31) On Bowstring Lake, Bowstring Shores Resort, Darv Oelke says; "Fishing has been Good. Yesterday Guys had the best Luck at 22 to 26 feet out on finch bar (center of the Lake). Fat heads And crawlers a few guys on Leeches. A few nice perch coming along with the Walleyes. A few Crappies were caught this past week. The first ones I have seen.A lot of wind yesterday from the west. So in front of the resort 12 to 16 feet should be Good." (5/31) On Lake of the Woods, Sportman's Lodges, Jacki LaValla said; "Walleye fishing was spotty over the holiday weekend. Yesterday was better than most of the weekend. The weather was not in our favor either which did not help. It sounds like we should slide into summer weather starting tomorrow and that should help the fishing. Gold & Pink jigs and hammered gold spinners tipped with a shiner or chub minnow have been working best in 22'-28' of water just outside of Pine Island, Morris Point and Zippel Bay." (5/31) On Lake of the Woods, Border View Lodge, Mike Kinsella says; Walleyes are biting in 26 to 30 feet in front of Morris Point gap. A gold and pink jig tipped with a minnow is working well when there is a “chop” on the water. When the wind is down, anglers seem to have better luck pulling spinners and crawler harnesses. Four mile bay has been producing some nice walleyes, but the bite hasn’t been consistent. Fishing has been Good. Yesterday Guys had the best Luck at 22 to 26 feet out on finch bar (center of the Lake). Fat heads And crawlers a few guys on Leeches. A few nice perch coming along with the Walleyes. A few Crappies were caught this past week. The first ones I have seen.A lot of wind yesterday from the west. So in front of the resort 12 to 16 feet should be Good. Fishing Report May 30, 2012 Jeff Sundin - On Tuesday, fishing conditions were challenging to say the least. West winds at 25 MPH, rain showers and cold temperatures. I was back on duty with the Finch's and when I arrived at Bowen Lodge to pick them up, whitecaps were already pounding into the North shore of Lake Winnie. Walleyes were not on the agenda anyway, and looking at the big lake, I decided that what I really wanted was to find a really small lake, tucked away in the woods, where we could catch some Perch or panfish. I had an interesting tip from a good friend about a small lake that I'd never fished and this seemed like a great time to take a road trip and make an adventure out of the day. After that came a series of interesting mis-cues; After a 45 mile drive to the lake, we dropped in the boat and looked around. Brown, muddy water and tiny Perch were all we found, hmmm...... something isn't right here. Oops, I missed my turn into the un-marked lake and mistakenly put the boat onto the wrong lake. Do-over, after a call, we figured out where the the "right" lake was and started up again. When we arrived, the water was really high, flooding the land ramp and covering part of the parking area. We muscled the boat in anyway and found the breakline. As promised, the Perch were there, nice size Perch too! But they were in the weeds and so were the Northern Pike. Thanks to the hungry scissor-bills, within a half hour, I'd already tied on 8 or 10 new jigs. We poked around and picked up some Perch and I kept a pair of Walleyes for dinner, but between the wind, cold rain and fisghting the weeds, we decided that this lake was gonna get put on the come back list for another, warmer day. On our way to lake 3, which was really supposed to be lake 2, a phone call about our sick horse interrupted the plan. He had escaped from lockup and was trying to make himself even sicker. So back to Deer River we went and once we got him locked up again, there was no point in heading back accross country. Instead, we proceeded to lake 4 which was really supposed to be lake 2, but actually worked out to be lake 3. I was hoping to find some Crappies that were active in spite of the cold weather. We didn't have too much trouble finding some fish. There were a couple of packs roaming around just off the breakline in about 18 feet of water. Easily recognized as Crappies on the Humminbird, the fish refused to even tickle our baits. The best we could do was to catch some Perch, smaller than we'd have liked, but the only game in town. We toughed it out until 7:00 PM, (I think just to prove we were trying), and then headed back to the resort, where the fish fry turned out to be the highlight of the day. So there ya go, we wanted an adventure and yes, I think that qualifies. Oh, and by the way, how was your day? Fishing Report May 29, 2012 Jeff Sundin - Well, the first benchmark of the 2012 season has been passed. On the lake, Memorial Day weekend crowds were lighter than usual, thanks in large part to the weather. At mid-day on Sunday, as I was driving toward Cutfoot Sioux, there was a steady flow of frustrated anglers working their way South on Hwy. 46. Here's a snippet from my comments yesterday "I couldn't have written this better if I'd made it up. The quintessetial Memorial Day! Cloudy until noon, gradually becoming mostly sunny. It always happens this way, always, you couldn't make it up, really, you just can't". Well for the anglers who chose to stay and tough it out though, the weather did clear up and the fishing was was actually pretty darn good. I was suprised on Monday when I expected the sunny skies to trigger the dead spell that sometimes accompanies the "aftermath of the storm". Instead, Walleyes were at least as active as they've been on most outings. Honestly, the action was better than it's been on a lot of the days that is "should have been good, but wasn't". Fishing with a group of repeat customers who have become good friends, I knew before we gathered that our mission would be Walleye or die! Taking no chances, I decided to stick with proven territory, launching first on Bowstring, with Sand Lake as the backup plan. When we arrived, the sunshine was already pushing away the clouds and there was a chop on the lakes surface. Surface temperatures were hovering just above 60 degrees and would remain there for the rest of the day. Starting the milk run on mid-lake humps, I buzzed the first one and found that Walleyes were still occupying similar territory that they'd been on a few days before. Fishing in 21-23 feet of water, using 1/4 ounce jigs tipped with minnows, we had 4 or 5 fish in the cooler after the first pass. As we checked more spots, we found similar patterns on just about all of them. Some spots held more fish than others, but it was clear that if I could see them on the Humminbird, we could catch them. This has been a common theme on a variety of lakes over the past week and it's worth making a note. If you were on the lake this weeekend, frustrated by a lack of action, the problem was location, nothing else. Make a promise to yourself that the next time you head to the lake, you'll spend more time looking for fish before you drop a line in the water. I promise, this is going to help you catch more fish! After lunch, we stuck with the deep pattern, finding fish in fresh territory became a little tricky, but when we found some, we could still catch 'em. Deep points, "Lake of the Woods style" mud humps and even a few fish on rocks. By the end of the day, the breeze picked up and eventually turned into a full scale wind storm. I'm pretty sure that fishing the shoreline would have made the agenda if we'd stayed much longer. There are still fish in the shallows and that would have been the perfect time to move in on them. (5/29) Zach Dagel, Grand Rapids Guide Service. Fishing in the Grand Rapids area has been picking up and Zach checked in with a few details. Read Zach's Fishing Report Here . (5/29) Have you ever heard someone describe a lake as being shaped "Like A Bowl?". Locating Walleyes in flat basin lakes can be confusing, but there are ways to dial in the fish. I got a note from my fishing buddy, Jon Thelen and Jon can tell you that even in a giant bowl like Lake of the Woods, there are still subtle structures that attract fish. Jon was up in Baudette this week, checking out the Walleye action on Lake of the Woods and he's got them all dialed in for this weekend, yes right now! All you need to do is watch the video, pick up some jigs and get up there. Click to view >> This Week On Lake of the Woods. (5/29) Bemidji Lakes Area, Paul A. Nelson, Bemidji Area Lakes Guide Service says; " Surface water temperatures were falling in the Bemidji area this week, with several days of unseasonably cold temperatures, heavy rains and strong winds cooling down the lakes. Most lakes had surface water temperatures in the low to mid 60s before last weekend, but storms and a couple of severe cold fronts dropped surface water temperatures back below 60 degrees in most lakes. Falling water temperatures have caused many of the crappies and sunfish to back out of the shallows and many of the largemouth bass have not spawned yet because of the cool weather. Walleye anglers are still finding walleyes on shoreline connected structure in most lakes. Many walleyes have either been on the cabbage weed edge in 6-12 feet of water or on the edges of structure in 14-20 feet of water. Jigs and shiner minnows have been the hot bait for most anglers, but live bait rigs with larger minnows or leeches have also been working for some anglers. Spinner rigs were also beginning to work, with the bite improving as water temperatures begin to increase again. Muskie season opens this Saturday, June 2, 2012. Some anglers like to fish bucktail spinners early in the season because they are easy to fish over the tops of the developing weed beds. The best approach is usually make long casts and retrieve the bucktails fast, but not fast enough for the lures to break the surface of the water." - Paul A. Nelson, Bemidji Area Lakes Guide Service 218.759.2235. (5/29) On Lake of the Woods, Border View Lodge, Mike Kinsella says; "Walleyes are biting in 26 to 30 feet in front of Morris Point gap. A gold and pink jig tipped with a minnow is working well when there is a “chop” on the water. When the wind is down, anglers seem to have better luck pulling spinners and crawler harnesses. Four mile bay has been producing some nice walleyes, but the bite hasn’t been consistent. There is a chance of showers throughout the week. Cooler during the early part of the week, but will be warming towards the weekend." There are still some great opportunities to book a guided charter trip this summer. Give us a call and let us hook you up! (5/29) Greg Clusiau's Iron Range Report - This would be the first trip of the year for my Lund, which had been patiently waiting in the garage. Up until now, I had been fishing open water for over a month and didn’t need the bigger rig. It had all been from shore, wade fishing, or puddle jumping with my ... click >> read full fishing report. Fishing Report May 28, 2012 Jeff Sundin - Well, that's what I call lucky! A day that started with turbulence, crummy weather and bad news, still ends with a smile, maybe more! On Sunday, thunder, lightning and pouring rain set the door ajar, just enough to let in a series of life's little problems. What looked like a day filled with cancelled fishing trips, sick horses and grumpy kids; turned out to be a day of fast recoveries, salvaged fishing and smiles all the way around. Sometimes, it's just good to be lucky. By the time a string of thunderstorms exhausted itself, I had gotten a call from my friend Travis Krug, who said that the rain had stopped and that his kids were ready to hit the lake. Okay, good enough for me, so I loaded up the boat and we got the trip back on track. I met them at the resort on Cutfoot Sioux at about 11:15. The wind was still blowing out of the Sotheast at about 20 MPH, so we opted not to struggle with big waves. Instead, we rolled over to Sand Lake, where I had high hopes that the storms effects wouldn't be enough to kill the action. When we arrived, the landing was nearly empty, there was standing water everywhere and the lake looked more like a scene from the end of the season than from the beginning. The surface temperature had fallen a bit, now 59 degrees compared to almost 61 on Saturday, but there was a nice chop on the surface, good drifting conditions and little or no competition for places to fish. The Humminbird was working on overtime as we moved from spot to spot, looking for evidence of small, scattered groups of fish. Luckily, there were a few fish at almost every stop, not always what we wanted, but always enough to keep the boys busy until the next move. In deep water, especially the deep points on main lake structures, we found Walleyes in groups of 3 to 6 fish at a time. Mostly small fish, too small, but sometimes there was a good "keeper" fish mixed in with them. At one stop, a mid lake hump, I marked a half dozen fish on the down wind tip and on our first pass through, we caught a 16 incher, a 13 incher and a 10 incher. There was no ryhme or reason to any of it, we just had to keep fishing and sort through the fish as we went. Maybe the Grey skies and breezy conditions were off-setting the effects of the storms, but As the day progressed, the fish seemed to move shallower. Small Pike stayed deep, 20 to 25 feet, but a mixed bag of Rock Bass, Perch and Walleye (in that order) were moving in water depths of 8 to 12 feet. Our best spot was a rocky point surrounded by weeds. The fish were scattered on the point in varrying depths, so we just had to be patient, fishing the structure from several angles and depths. Just about the time the boat started getting quiet, someone would hook another fish. We only fished with jig and minnow and for the most part, and because the holiday traffic had crushed the supply of Shiners, we only had fatheads. It didn't seem to matter all that much (to the fish), but in order to be sure that I have enough "good size" Fatheads, I do have to buy about twice as many minnows and then sort through them as we fish. Walleyes are really happy to eat the Fatheads as long as they're the right size. Too small and you are fishing for Perch and Rock Bass, too big? There is no such thing as a fathead that's too big, the larger they are, the better they work. By days end, there were nine or ten nice size Walleyes in the cooler, along with a meal or two of fairly good size Perch. We had released a ton of other fish too and the boys had gotten plenty of action. By late evening, there were smiles on the boy's faces, better news from home about the sick horse and generally speaking, it was hard to ignore that there were good vibrations coming in from everywhere. Fishing Report May 27, 2012 Jeff Sundin - Welcome to Memorial Day Weekend and to a grand display of thunder, lightning and an all night rainfall. So far this season, early morning reports of gloom about the weather have turned out to be un-founded. But today, it's gonna take some fast recovery time if we want to get out on the lake. For me, one of the biggest disappointments of last year, the 2011 fishing season, was that rainy weather forced me to let my garden sit dormant all summer long. There's no better feeling than to have a garden planted and growing, but so far, this summer is disappointing too. Hopefully, the gloominess will give us a break soon and the garden can get the attention it desrves. Mixed Bag Fishing was on my agenda on Saturday and in spite of the cold front, we managed to pull off a fairly good trip. When I picked up my crew at the resort, the air temperature was 45 degrees, but the winds were light and the rain was holding off. After a chat about our goals, we decided to take a run over to Sand Lake, where reports have been good so far this spring. The surface temperature was 60.5 degrees and remained steady througout the day. There was a light breeze, just barely enough for a drift. Scanning the deeper breaklines in 18 to 24 feet of water, there were small packs of fish showing up in a variety of locations. None of them looked any larger than another and none looked much smaller either. Since fish seemed to be scattered, it looked like the best bet was to start hopping from point to point, constantly covering new territory. We started fishing the main shoreline breaks in about 20 feet, 1/4 ounce jig and minnow combinations, drifting or at times slowly trolling with the MinnKota. There were some Walleyes, mainly small ones and some Northern Pike, really small ones along most of these areas. If I marked fish on the screen, they bit. In fact, it was pretty easy fishing. One ting I'll say about Sand Lake right now, there are a ton of small Walleyes in there. Ten to 12 inch fish were common and we probably released 25 or more of them during our exploratrion. Once I got off of the shoreline break and started working on deep points and some small, mid lake bars, things got a little more exciting. Some of the Walleye were runnintg a little larger, but even here, if we wanted fish for a fish fry, we could see that we'd have to set the bar somewhere between 13 - 14 inches. We gathered some small ones a handful of nice ones and then moved shallower. Crappies were on the agenda, so I headed for a couple of normally reliable spots and at first, it looked like we were in good shape. Skip caught a 13 incher and followed that up with a 14 incher. After that we caught about 20 Rock Bass, but Crappies, no more. Another stop, later in the morning would yield one additional Crappie, but the action wasn't fast enough to hold our attention any longer. Perch are good substitute, so next we tried a few spots and found them somewhat more cooperative. Back to the 1/4 ounce jig and minnow, we fished in 10 to 12 feet of water where there were patches of newly emerging weeds. There were a good number of Perch in these areas, but in the calm water, they were a little tricky to hook. They were displaying their irksome habit of picking at the baits and spitting them out before the crew could get the hook set. Even so, we gathered about 20 nice Jumbos, enough for a few good meals. All things considered, it was a productive day. Even if we never found a really "hot bite", there were at least some fish at every stop. In one form or another, there was action throughout most of the day. Key areas were the main shoreline breaks in 18 to 22 feet, weed patches in 10 to 12 feet and mid lake humps/bars in 16 to 20 feet. Crappie action has been good, according to reports coming in from the Itasca area. I'm not sure if the fish are all in the same pattern, because some of the reports mention fish that are still filled with spawn, some of them don't. It's hard for me to talk about specific Crappie lakes, especially small ones, because many of these reports are from friends who want to protect their favorite spots. I don't blame them, and I respect their territory so I won't be real specific. But, if you have a couple of your own favorite lakes, it sounds like a good time to venture out and give them a try. May 23, 2012 - On Lake Winnie and Cutfoot Sioux, Memorial Day weekend is upon us and the fish are here, ready for you. They're trying to be sneaky, but we've got some tips for how you can find 'em and catch 'em! On Lake Winnie, Walleye are little bit ahead of an ordinary spring schedule, but not so far ahead that you can locate them following summer patterns. Some of your favorite Memorial Day locations might be good, but it's a good idea to prepare yourself for a new experience this season. (5/23) On Bowstring Lake Otters Guide Service, Robby Ott Says; "My most recent trips have been to Sand Lake and Big Bowstring. Walleyes and crappies have been more than willing to cooperate. What we are seeing is walleye movement out to humps near shoreline drop offs.. Although there is still some activity on main lake points that reach out to deep water (transition period). There is also positive results in growing cabbage beds that have not seen alot of action. Jig and minnow bite in shallow and seeing good results on leeches and crawlers on some humps. On calmer days, we have been using Northland fire balls tipped with a half of crawler. Or fire balls tipped with a leech, hooked through the sucker. If you have some good results trying these tactics, bring along some of Northlands Super Charged Impulse leeches and crawlers. I believe you will like the results. Male Crappies have been fanning there beds. Females are staging, a waiting mother nature to ring the bell. It seems to me that the process has been prolonging due to weather. Good luck out there and be safe". Otters Guide Service. (5/23) On Ball Club Lake, Gus' Place Resort. Gus says; The early warm Spring weather has jump started a strong multi-species bite Ball Club Lake. The lake is one of the deepest in the area and the bite doesn't usually pick up until mid June, but this year is different. We are already in the low 60s on the lake and the fishing has been excellent. The action is still in 10 feet or less, anchored or slow drifting and trolling with live bait, use slip bobbers or jigs. The South end of the lake has the warmest water and that is where most of the action has been. Walleye, Perch, Northern and Crappie are all being caught in shallow water. The Crappie have not yet spawned. Fish the South East shoreline for the best action during the Spring. (5/23) Bemidji Lakes Area, Paul A. Nelson, Bemidji Area Lakes Guide Service says; "The Memorial Day Weekend is one of the busiest weekends of the summer on the lakes. Memorial Weekend is also one of the best fishing weekends of the season for many species. The peak of the spring walleye bite is happening right now on the lakes in the Bemidji area. Most of the walleyes are on shoreline connected structure feeding on spawning spot tail shiners. The bass opener is this weekend, with anglers able to fish for both largemouth and smallmouth bass starting on Saturday May 26th. Crappies and sunfish are also very active in the shallows as they get ready to spawn. Anglers have many choices on the lakes this weekend, with only musky fishing closed until June 2nd. Walleye fishing has been good on most of the larger lakes in the Bemidji area. Most anglers are using jigs and shiner minnows for walleyes, but other presentations are starting to work for walleyes as the water temperatures increase. Anglers should be able to use most presentations for walleyes this weekend, with a reasonable chance for success. Most of the active walleyes have been in 8-12 feet of water when they are active, but there are a few walleyes beginning to move off of the shoreline structure to mid-lake structure in deeper water. Oxygen levels in the lakes are good at all depths, so there is nothing limiting where the walleyes can go, as long as they are able to find enough to eat. Crappies and sunfish have both been active in shallow water close to their spawning areas. Most anglers use bobber rigs for crappies and sunfish to keep their baits off the bottom and in the same zone as the panfish. Paul A. Nelson, Bemidji Area Lakes Guide Service 218.759.2235. (5/23) Ryan Peterson checked in; "First of 3 days fishing with with a new group so we decide to fish Winnie. Fishing was decent, but we had to work small schools off fish on the break line in 13 feet of water. You would pick off 2 or 3 then had to work your way down till you marked a few more fish and work that small school. On the windy days, Winnie and Leech Lake Walleyes are more aggressive and the action has been good in the 6 to 9 foot range. 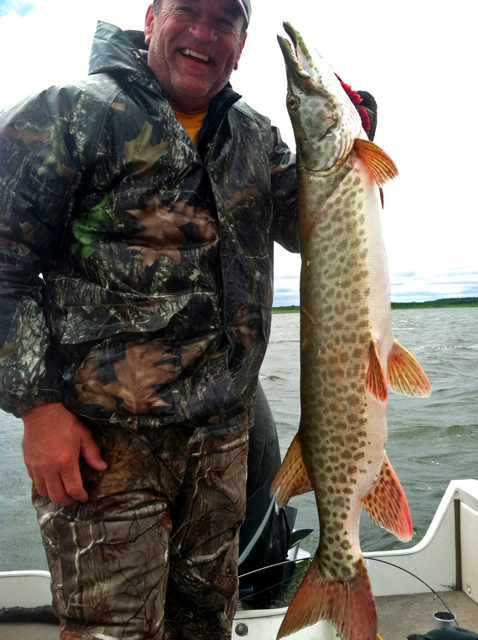 (5/25) On Lake of the Woods, Sportman's Lodges, Jacki LaValla checked in; "Good fishing going on. We have received a little rain but nothing real measurable. Most of the heavy stuff has missed us this week. Areas outside of Pine Island 21'-27' using gold, orange and pink jigs or hammered gold spinners tipped with a chub or shiner has been working well. We are offering some last minute Charter Fishing Package specials May 24-June 5. Up to $40 in savings per person available. Give us a call! (5/23) On Lake of the Woods, Wigwam Resort, Baudette checked in; "Fishing is good right out of Lighthouse Gap in 24-28 feet of water, anchor and jig seems to be working with gold for a popular color. Many walleye and sauger are in the 16” to 18” range – just perfect for throwing in the fry pan and served up with some shore lunch potatoes. If jigging, minnows are doing the trick but others are pulling spinners in 14-16 feet using crawlers or minnows." If you haven’t set your compass due north to the Wigwam Resort on Lake of the Woods, now is the time to head our way. Memorial Day weekend is just around the corner and we still have 3 cabins available. Check out our website at wigwamresortlow.com and give us a call at 1-800-448-9260. (5/23) On Lake Winnie and Cutfoot Sioux, Eagle Nest Lodge, Bryan Harris said; "Our guys have been doing ok...not great. They are catching enough for a fish fry and taking some home. It has been mostly jig and shiner, but a few guys have started using leeches on a Lindy rig. The minnows are in shallow...under the dock. The bite has been shallow as well, with the best action between 4 and 8 feet. Cutfoot spots have been McAvity Bay, Bowen's bay, Clambed and the gap. Winnie spots have been the river channel and rock pile. (5/21) On Upper Red Lake, Strong winds forced Walleye anglers to stick with shoreline areas on the lee side. On Saturday, the South shoreline, along with some of the rock humps and bars were holding fish. Jig and minnow combinations, Lindy Spinners and shallow running crankbaits were all producing good results. On Sunday, the stong North winds forced everyone to move onto the North side of the lake. Similar patterns worked, but with heavily agitated water, fishing was slower. Once the winds stopped, fishing began to pick up and should recover again as soon as the water clears up. (5/21) On Lake Winnibigosh, The shallow water bite has been tricky. It's hit and miss unless you keep moving until fish are located. For some anglers, fishing was fantastic and for others, it was a head scratcher this weekend. The best advice I can give right now; When the wind is blowing, try to cover as many spots on the shoreline as time will allow. Key on areas where there is enough wave action for a good drift. My favorite is when the wind is moving parallel or slight into the shoreline. When conditions are flat, Walleyes have been moving away from shoreline structure and out onto mid-depth flats. Water depths of 12 to 16 feet are key, use your electronics to find small pods of fish, mark the spot and fish with jig and minnow, Lindy Rigs or spinners. (5/21) On Lake Winnibigosh, The Winnie report from Reed Ylitalo; "I had my first guide trip of the year and we did really well on Saturday. Finding limits of walleyes in 9 to 5 feet of water down the north shore, water temp was 60 to 61 degrees gold, Crome and blue 8th oz jigs tipped with a small shiner did the trick. (5/21) On Lake of the Woods, Mike Kinsella at Border View Lodge: "Nice catches of walleye are coming out of 26 to 29 feet near the Lighthouse gap and along the south shore. Anchoring with a jig and minnow has been working well. Others are having success in 13 to 16 feet pulling spinners with a crawler or minnow. Gold has been an excellent color choice. Our current water temperature has warmed to 61 degrees. Highs will be in the low 70s for most of the week with a chan ce of showers and calmer winds. Forecast is a little cooler towards the weekend. Fishing Report May 26, 2012 Jeff Sundin - The arriving Memorial Weekend anglers were greeted by some chilly, breezy holiday weekend weather. West winds at around 20 MPH and a crisp overnight cold front reminded me of fishing in late September. Knowing that I'd be looking for a place to cook shore lunch, I picked the Eagle Nest Landing at the North side of Cutfoot Sioux, for launching the boat. The protected shoreline along Seeleye Point gave us the impression that conditions on Lake Winnibigosh would be manageable so we went ahead and put in there. As we went out through the gap, there were already some whitecaps on top of about 2 foot rollers. The cold air, was making me worry about the possible side affects of trying to fish after a cold front, but I'd been hoping that the wind would help offset that problem. We were able to make our way up the North Shore without any real trouble, but in the end, I'd wish that I hadn't. We made three or four stops along the way, each of them producing a handful of Perch, a couple of small Northerns and a few missed strikes. We kept moving West, looking for a better spot until we finally arrived at Stony Point. There, we found a small crowd of boats, each of them catching a mixed bag of Perch and some Walleye. Not the worlds greatest bite, but better than we'd seen so far. So I staked out a little bit of open territory and started snooping around. Fishing in 6 to 7 feet of water, using 1/8 Lindy Jigs tipped with Shiners, we were able to catch a hodge podge of fish for lunch. There were some average size Perch, a few over-sized slot Walleyes, a few tiny throw back Walleyes and a few keepers. With a little less wind, the action could have probably been fairly good, but the strong West wind was not good for us. For my crew, it was just tricky to get a good sense of feel while the boat was rocking up and down, side to side and bow to stern all at the same time. As soon as we had enough fish for lunch, I headed back for the campground, knowing that Winnie was off of my list for the afternoon. After lunch, we headed for Bowstring where we found the conditions to be a little more friendly. There was still plenty of wind, but by sticking close to the Northwest corner of the lake, we managed to find a half dozen spots that were harboring small, but semi-active schools of Walleye. The fish were aggressive enough to bite, but we had to do some teasing to get the fish hooked. It's fair to say that we missed, or lost as many fish as we caught, but we still came close to gathering a limit for the crew. If we came up short, it was due to our own mistakes. Presentation was 1/4 ounce jigs tipped with Shiners, fished in 18 to 20 feet of water. The main lake humps and bars are where I start, but I haven't been afraid to drift out onto the soft bottom flats either. There are some fish wandering around out there too. For today, a few Walleye are all we need, so I'm hoping to locate some panfish to help round out the larder. Maybe Crappie, maybe Perch, who knows, we'll be going with the flow. Fishing Report May 25, 2012 Jeff Sundin - The giant panick attack about heavy rains on Thursday turned out to be un-founded. Oh sure, there was rain, but for most of the day, it wasn't much more than a little sprinkle. My biggest problem was that it messed up my hair do! A friend suggested shaving it off, which I think might be cool. Especially because then I'd look more like my pal Jonny P. But on the other hand, I could wind up looking like a Hot Tamale' by the end of the summer! If you've ever fished on Bowstring Lake, and if you've used the Lakemaster Chip in your Humminbird, well then you've seen a spot called "Finch Bar". Well yesterday, I was fishing with the spots nameskes, Skip and Sandy Finch so it just seemed like a good idea to take them over to Bowstring and see if they still had the magic on that lake. When we got there, the lake was flat as a pancake, which worried me some, but the Grey sky helped offset the lack of wind at least I hoped so. From the landing we headed straight out to a deep, mud flat that I like to buzz any time I'm on Bowstring. This week, ideal Walleye location has been deeper, mid lake structures adjacent to soft, clay/marl bottom. In fact no matter which lake(s) we've mentioned, deeper, flat water spots turned out to be the theme of the week on most of them. The fish are feeding on a combination of insect larvae and small baitfish that are on the flats also eating larvae. This type of fishing drives guys like me nuts because instead of following well defined structure, we're following small pods of fish on much more subtle, sloppy structures. Instead of wathching the Humminbird for the breaklines and edges, were watching only for fish. The good news is that once located, they've been more than cooperative and yesterday was no exception. A 1/4 ounce Lindy Jig, tipped with a shiner was all we nedded. I kept the boat speed at around .50 MPH, so we were able to fish the jigs almost vertically, with only a light pumping action. We had a really similar experience on Lake Winnie just a couple of days ago, the same pattern is holding up over on Leech Lake too. It's probably a technique to keep in mind on your way to the lake this weekend, no matter where your heading. Fishing Report May 24, 2012 Jeff Sundin - On Wednesday, our fishing experience proved almost everything that I wrote on on Tuesday. So since I know you're in a hurry, I'll keep my comments short this morning and let you have a look at the reports from the last few days. Fishing Report May 23, 2012 Jeff Sundin - On Tuesday, Southeast winds pushed out the calm seas, and produced the classic "Walleye Chop" on Lake Winnibigosh. Once the fish got the memo, action increased and production was up. We followed through with our idea to take on what's been a hit and miss bite on Lake Winnie, in the end, we wrapped up our day with a nice bag of fish. There were some ups and downs for us though, as the search for an active school of eating size fish led us around the lake. Watching the tree-tops in the morning, it seemed clear that the wind was going to blow and conditions should have been good for a shoreline bite on the big lake. When we got on the lake though, it was breezy, but suprisingly calm, just enough wind for a drift, but not much more. Surface temperature on the South end of the lake was 58 degrees. Our first drift produced some fish, but the majority of them were small, too small. In fact some of them were yearling size, 9 to 10 inches. We were getting a keeper size fish occasionally, but after three or four drifts, it was clear that we'd need to go on the prowl for a better spot. I'd been comparing notes with friends all around the lake and it seemed like everyone was in the same boat, picking away at small schools of fish and adding to their larders, one fish at a time. Hoping to take advantage of a stronger wind, I headed for the Northwest corner of the lake, where I planned to fish some shallow rocks. Along the way, we could feel the wind calming and by the time we arrived, the lake was already going flat. Our first drift produced a couple of over-sized "slot-fish" and I was seeing fish on the Humminbird, but it looked like I showed up too late. There was a huge Black cloud hovering to the West and I hoped that it had temporarily stalled out the wind. Luckily for me, I guessed right this time and after a half hour lull, the breeze started picking up again and eventually, we were back on a full fledged drift. With the waves and current, fish began to appear again, a few at first, but the population kept building throughout the afternoon. By around 4:00 PM, there was a legitimate action bite going on. What all of that means is that Walleyes were spread out on the miles of mid-depth flats that surround shallow structures on Winnie's Northwest side. Once they felt the affects of the current, they beagan roaming their way toward the shallow rocks for feeding time. The way that our day played out, provided lots of clues for anglers preparing for the Memorial Day weeekend. Click here to learn more about >> Lake Winnie Walleye Strageties. Fishing Report May 22, 2012 Jeff Sundin - A quick note before the report; For the past 25 years, almost everyone who ever shared the boat with me has known Jesse Priem, they just didn't know it. You see, Jesse had a way of coining phrases that were just too good not to remember. If you've fished with me, then you have certainly heard at least one "JESSE-ISM", probably more. Isn't that right, Big Daddy? (5/22) The classic, "calm after the storm" struck the Deer River area on Monday. It was a beautiful, sunshiny, calm day. I knew that we'd have to work harder at fishing than the we did over the weekend, but under the circumstances, it still wasn't too bad. Some of the Itasca area lakes held up better than others, so the reports were spotty. This year, Lake Winnie and Leech Lake have both been dependent on good winds to kick start action. For example, Leech Lake provided hot action on Sunday, but was a struggle for most anglers on Monday. The same scenario played out on Winnie, also on Cass Lake. Lakes with darker water held up somewhat better, but were clearly lacking the spark to turn "okay fishing" into a "hot bite". The way to look at lake options for the rest of this week should include heavy emphasis on wind direction and speed. On days with Grey skies and heavy wind, tackle the shoreline areas on the larger lakes. If it's flat, pick out a couple of smaller lakes, with stained water and try working the deeper structures. Weeds are beginning to develop, so be sure to check out some of those areas too. Fishing Report May 21, 2012 Jeff Sundin - To say that it was a turbulent weekend in the Deer River area, is an understatement. For many, the weather was less than ideal for being outside the house. But for those folks who just happened to be die-hard Walleye fisherman, things couldn't have worked out too much better. Fish in the Deer River area never got the memo; Thunderstorms, cold fronts, wind direction changes, all of the conditions that are supposed to make Walleye fishing tough, rolled over them and they just kept on biting anyway! I think the reason for that is because so far, water temeperatures haven't made it much over 60 degrees and food supplies (for the fish) are still low. Hungry Walleye don't have much incentive to go into a negative mood right now. If we had the same set of conditions in say, mid-July, I'd probably writning a story about how the fish got a case of lock-jaw. There were good reports coming in from Lake Winnie, Leech Lake, Bowstring and Upper Red Lake. Fish location and boat control were the keys to success. For most fishermen, if fish were found, then they were were caught. Fishing Report May 20, 2012 Jeff Sundin - I got a lucky break on Saturday, when the fishing trip that I feared would be cancelled, instead went off without a hitch. The thunder quit just in time to get to the lake and second wave of rain held off until just after we got off the lake. The second wave of rain came in on a sharp, cold front and has been falling softly for most of the night. It's going to be interesting today, finding out what happens when a 30 degree dip in temperature hits before the surface temps have ever warmed up and out of the high 50 degree range. It could go either way, the fish could go dormant for a while as they wait for the shallow water to warm up; or they could drop back off of the shallow flats and get crowded onto the breaklines. When that happens, even if these fish are less active, there are more of them in a confined space and the additional numbers can result in making "the bite "seem" better. On Saturday; we, along with many others, stuck with the deeper water pattern that had worked well for most of the week on Bowstring. This time, the fish seemed to be oblivious to the thuderstorms and lightning that had blown trough on Friday night and early Saturday morning. I'm still not sure if I know exactly why they are spread out over the deeper water, soft bottom flats, but they are. My best guess is still that there's an insect hatch going on out there. I got a little more convinced about that when I saw suspended fish of all shapes and sizes on the Humminbird. Some small Suckers or maybe even tulibees were working the surface, over this deep water too. The fish are a little bit nomdaic; the area we fished on Friday held only a handful of fish, but there was a larger group of fish a couple miles away, lying on what was essentially the same breakline we'd fished on Friday. In the heavy water, I didn't look around as much as I should have, but it wouldn't surprise me to find other schools of fish scattered around the lake too. Presentation was the same as Friday. Using 3/8 ounce Lindy Jigs tipped with large Fatheads or Shiners, we worked them as nearly vertically as possible, bumping the bottom and then lifting it back up out of the mud. Most of the time, fish thay I markled on the graph were active enough to strike. But, they were not really aggressive, it took 10 or 15 seconds of teasing to be successful at hooking them. Fishing Report May 19, 2012 Jeff Sundin - It's gonna be a quick update this morning. After a hot, muggy day on Friday, a line of strong thunderstorms blew through the Deer River area, knocking out the electricity and keeping us off the grid for most of the night. It's still rumbling out there right now and today's fishing trip could be in a little bit of trouble. On Friday, Mid-summer conditions made us feel more like we were fishing in July than in May. If you had just been awakened from a nap, you'd swear that you'd been asleep for two months, everything looked and felt just like mid-summer. Those ankle biting, black flies were feeling it too, all of that warm air and the incoming storm, put them on a feeding frenzy. Luckily for them, they found something really good to eat, Me! There was a lot of love in the air though, and luckily we got some of it, hand delivered in the form of good fishing. Albeit, a little different pattern than you'd expect. On Bowstring Lake, we found surface temperatures hovering right at 60 degrees and a nice Walleye chop on the surface. The kind of wind that's manageble, but still strong enough to fire up the fish. After checking out a couple of shoreline spots, it was obvious that we were going to come up short if we stuck with that game plan. So, remembering all of the suspended fish that we'd seen on Jessie Lake the day before, we decided to buzz a few of the deeper, summer spots. That's where they were, 22 to 30 feet of water on the transition from deep structure to mud. There was a mixed bag of Walleye and Perch that were apparently already feeding on some kind of early insect hatch. Later, when I cleaned the fish, none of them had minnows in their stomachs, only a little bit of black, insect larvae. We didn't see any evidence of a serious Mayfly hatch, but there was an assortment of little bugs flying around and I'll bet that the Mayflies aren't too far behind them. Presentation was simple, 3/8 ounce jigs tipped with minnows and fished with a slow lift-drop motion. The fish weren't too aggressive, especially the Perch. We had to give them a lot of time before setting the hook and if we tried to set hard, we'd miss 75% of the bites. The best hook set was to lift the rod, reel slowly and just give them a little flick of the wrist. That way, we caught a lot more fish. It did not matter if we used Shiners or Fatheads, as long as the Fatheads were good size. In fact, if you want to capture some extra Perch, the Fatheads would do a better job. We didn't try rigging eeches or Night Crawlers, but I think that it would have worked, and when I got home, a message from a friend said that he'd been using Crawlers and that they were working well. So if you're a Lindy Rig fan, you can probably get started with that presentaion really soon. No matter where you're headin, if you're planning to head out on the lake this weekend, it would be a good idea to start scanning the deeper structures, especially the ones that connect to shore, but lead out into the main lake basin. (5/18) On Lake MilleLacs, the Walleye season is off to a good start. Walleyes have already begun top move out toward main lake structure, but there are still some fish on the shoreline breaks. Typical for MilleLacs, Lindy Rig fishing is putting plenty of fish in the boat, but jig and minnow combinations are still working on the shoreline too. (5/18) Oh, by the way, if you want some special, advanced fishing information about Lake MilleLacs for this weekend, be sure to check out Jon Thelen's new video report. Jon's been out there all week doing the scouting and he's got the fish and the presentation nailed down already. Now all you need to do is gather the information and head out there. Click >> This Week MilleLacs Walleye Video. (5/18) On Upper Red Lake, The action was good again on Thursday. Anglers were able to manage in the heavy winds by hugging the South and East shorelines. Shiners are still on their spawning mission and that's holding the Walleye in shallow water. Jig and minnow fishing in the 5 to 7 foot range will help you put some fish in the boat and right now, there is a high percentage of "keeper size" fish. Fishing Report May 18, 2012 Jeff Sundin - More wind = more warm weather as the flow of warm, moist air from the South will continue today. It looks like the stage is set for a good, old fashioned thunderstorm and today could be a great time to get out ahead of the front and catch some fish while they're "on the bite"! Yesterday's heavy winds gave us a chance to do some more big time head scratching. Heads down and hoods up, we looked for semi-protected places to catch some Perch, Pike and Walleye. I started on Round Lake, where the surface temperatures were in the 57-58 degree range. Gusty winds were tough to tackle out on the mid-lake structure, so I fished mainly in areas where we could control our drift speed, shoreline breaks on the East and South shores. The Walleyes on Round Lake are apparently off to a slow start, like they were last spring. We had some action in 5 to 7 feet of water, but not enough to keep us interested for the afternoon. At about 12:30 PM we trailered over to Jessie Lake, hoping to find the fish awake, but here too, the fish just weren't ready for prime time. Surface temperatures on Jessie were colder, 55 to 56 degrees and again, strong winds kept us pinned to the shoreline. Late in the afternoon, the weather calmed just enough to allow us access to more open water locations and we managed a little action out there. But I noticed that the majority of fish are suspended over deep water. In 30 feet of water, the Humminbird showed fish and baitfish hovering at 16 to 18 feet. I'd say that it's going to take another week or so before the shoreline fills with food and attracts Walleyes in for feeding time. After one short week of fishing, what I can see so far, is a trend toward the larger, shallower lake where water temperatures are the warmest. All of the best reports are coming from lakes with these features; Water temps at or above 60 degrees, lakes with strong populations of spawning Shiners, lakes with expanses of shallow, sandy shoreline. Make yourself a short list of lakes that come to mind and you'll be on the road toward putting some fish in your cooler this weekend. (5/17) On Lake Winnie, Brian Castellano checked in with a report; "We had our Law Enforcement fishing trip today on Winnie. While we couldn't have asked for a nicer day to be on the water, the lack of wind made it a tough bite. My boat ended up w/ a couple of nice keeper walleyes, a half dozen jumbo perch, and 3 nice northerns in the 4-5lb range We also let 5 slot fish go........17 1/4, 17 1/4, 18, 20 1/2, and 23". We caught the majority of our fish on hump that was just off the main shoreline structure. Our best depth was 12-17' of water with an 1/8 oz jig (pink or blue and white) and shiner. With the sluggish walleye bites, I was really wishing I would have had some leeches or crawlers along. We were just creeping along w/ the electric trolling motor. I think the fish are ahead of schedule a bit and some of them are already pulling out of the shallows to the 1st structure off of the main shoreline spots. A buddy and I were also out on Winnie Monday and it was flat calm. We caught a couple of keepers in 10.5 feet (shoreline) of water trolling Salmo Hornets. The only bad thing was that a pass or two over the fish would shut them down. Fishing Report May 17, 2012 Jeff Sundin - The early season roller coaster ride continued on Wednesday. Except this time we discovered how much more fun it is to be experience the peak, instead of the valley! We knew that the forecast of calm water and sunshine could be a problem, so I thought maybe it was a good day to pay Upper Red Lake a visit. Red Lake has a reputation for being better on calm days and the dark water helps on sunny days. I'd made some calls ahead of time and hadn't been givien any really glowing reports. But I thought that as long as I needed to "scrounge for fish", my odds were higher here than on some of the clear lakes closer to home. No matter how you look at it, we weren't expecting to find any bonanza when we got there. Guess what? It's nice to have a really good surprise sometimes. It turned out that we just happened to hit the right lake on the right day. After an hour of searching for the right area, I stumbled into a stretch of water about a mile long, where fish were active for the rest of the day. Spot Tail Shiners were moving onto the shallow sand in huge numbers, in fact I was snagging them with my jig all day long. As long as we were near the Shiners, we were near Walleyes and they were hungry! According to my friend Jonny P, who traps and wholesales minnow in Washkish, the Shiners were running like that all day long, in a variety of locations around the lake. Our presentation was really simple; 1/8 ounce jigs tipped with Shiners, snapped agressively on the shallow, shoreline break. My crew stuck with the live bait all day, but around noon, I tied on a Blue-Glow 1/8 ounce Lindy Jig and added a generic plastic minnow. It's Black-Silver and has a horizontal, Whale Tail. The fish gobbled them up just like they were real. Locations that offered patches of rock were betrter than plain sand, but there were fish on the sand too. If you're heading that way, watch for the clouds of minnows on your electronics and let that be what guides your decision about where to fish. Fishing Report May 16, 2012 Jeff Sundin - On Tuesday, the wind was back, but this time, a cold, Northwest wind was included in the package. There's no doubt that it was better than the 80 degree, flat calm weather we had on Monday. Improvement, yes, but the fish are still missing the message that this is spring and that they're supposed to be HUNGRY! Knowing that it would be windy, we decided that heading across country in the truck would be easier than heading across the lake by boat, so we put in at the Third River Landing on Lake Winnibigosh. That was smart, the ride out onto the main lake was easy and as it turned out, our best action would come from the Nortwest corner of Winnie, near .... Read full Lake Winnie Report here. Fishing Report May 15, 2012 Jeff Sundin - The kick-off of the 2012 fishing season has definitely had its ups and downs. In just three days of fishing, the weather has already changed three times! After the strong winds that churned up the lakes on Sunday, Monday's exhibition of flat seas and sunny skies was just what the doctor ordered .... to put the fish to sleep! We started our day on Bowstring Lake which had been good for most of the weekend anglers who visited. When we arrived on Monday, surface temperature was 58 degrees and the wind was flat calm. The North landing was loaded with bits and pieces of debris that had been tossed around the day before. Bulrushes, seaweed, snails and assorted odds and ends were laying all over the glassy surface. Walleye fishing was a struggle to say the least, we managed to capture a couple of marginal keepers, but most of the fish we did catch, were in the 10 to 12 inch range. As always, small Nortrhern Pike were ready, willing and able. For someone that had a fish fry in mind, Perch fishing might have been the way to go. There were a few areas where we caught decent size Perch as we searched for Walleye. If we'd been interested in those on this trip, we probably could have gathered a nice meal. Late in the day, we decided that we couldn't make things any worse by trying an experiment, so we headed down the road and gave jessie Lake a couple hour whirl. The results weren't a lot better there, except that Craig did bag one nice 18 inch Walleye on a jig and minnow. On Jessie, we marked some fish in 18 to 24 feet of water, but when we attempted to catch them, they gave us only a couple of of half-hearted bites. (5/15) Bemidji Lakes Area, Paul A. Nelson, Bemidji Area Lakes Guide Service says; "The walleye season is finally open, with a busy weekend on the lakes in the Bemidji area. The conditions were better for fishing on Saturday, with heavier winds on Sunday and many less anglers on the lakes. Surface water temperatures in most lakes in the Bemidji area are now in the mid to upper 50s, so the bite should be very good for walleyes this week, with the peak spring bite usually occurring about the time the lakes can hold 60 degrees overnight for the first time. Surface temperatures on the lakes can soar on calm hot days, but the most accurate measure of surface water temperatures is in the mornings, before the sun has had a chance to warm the water. Anglers are beginning to see some midges hatching on the lakes, which are usually the first of the fish fly hatches in the spring. The early ice out and the warmer water temperatures will likely cause the insect hatches to occur earlier this year, with a good chance the “mayfly” hatches will actually start in May this year. Spot tail shiners are moving into the shallows to spawn in most of the larger lakes. Walleyes often stay on shoreline structure as long as the shiners are in the shallows to spawn. Walleyes usually begin to move to mid-lake structure about the same time the shiners are finishing spawning and the mayfly hatches are beginning in deeper water. Crappies, sunfish and bass are all members of the sunfish family and will begin to spawn when water temperatures reach the upper 60s to low 70s. May 15, 2012 - On Lake Winnie and Cutfoot Sioux, the 2012 Walleye Fishing Opener started off strong for our guests. Large crowds are typical on opening weekend and as expected, there were plenty of boats out there on Saturday. The weather was nearly ideal, light breeze, sunny skies and fairly good Walleye action. Perch action was good too, and depending on the location, some anglers found a nice supply of bonus jumbos to round out their bag and provide for a great fish fry. (5/15) On Lake Winnie, Scott Glorvigen checked in with a report; "Winnie we caught our walleyes in 8-9 foot adjacent to the big shoreline flats on 1/8 oz. Northland Fireball jigs tipped with shiner minnow. Lime Green/Chartruesse best color. Seemed to be if you found the Perch the Walleyes were close by. Most of our fish were overs 17 inches plus". On Bowstring on Sunday, Scott says it was "windy as heck!!! But the fishing was good. Caught our walleyes in 5-7 foot of water dragging ¼ oz. Northland Stand Up Fire Ball Jigs tipped with a shiner minnow. Yellow/Orange best color. If you hopped the jigs to much the little Northern Pike would eat it in a second. Also got on to a bunch of nice Perch in 10-12 of water off underwater point going into deeper water. Water Temp 57-58 degrees. Over the next week big shoreline flats should have plenty of Shiner minnows spawning on them and the Walleyes should be on the feed. Best to fish the windswept areas on those flats and try to avoid motoring over the schools of walleyes when making another drift." Remember to be respectful of your fellow anglers and enjoy the day. Overall it was a good opener in Northern MN, Scott Glorvigen. (5/15) On Lake Winnie, Jason Green, UPNORTH checked in; "I hope everyone had a fantastic MN Fishing Opener and Mothers Day weekend! Our weekend on Winnie for the most part was pretty much the same as years past. Do a lot of poking around using the electronics to find schools of bait fish. Once found, fish that area hard with a 1/16oz jig tipped with a shiner. The problem was we seemed to only get 2 or 3 fish to bite each time and then we would have to go into search mode again. High Skies seemed to have fish scattered also. We found fish as deep as 11' and as shallow as 4'. Many of the fish we marked were up off the bottom so using a lighter jig helped keep the presentation in the strike zone. It looks like over the next few days we are going to have to put the miles on to stay on top of active fish." Jason Green. (5/15) On Lake of the Woods; Mike Kinsella, Border View Lodge says; "It was a windy start to the 2012 walleye opener, but the fishing was excellent. South shore is producing nice walleye s in 19 to 25 feet. There are still some nice walleyes in the river. The river bite is not as fast, but those with patience brought in some nice fish. Live and frozen shiners are the bait of choice. Others had success drifting with spinners and crawlers. Looks like a beautiful week coming up weather wise. Highs will be in the low 70s with lots of sunshine. Our cu rrent water temperature is 55 degrees. We have some midweek and our guides are ready to put you on the fish! Finally, I have more reports coing in right now, but I'm up against the clock. See you on the lake, and remember to check in tomorrow for more. (5/11) Q&A About Transporting Live Bait. On Thursday, Vern Valliant emailed this question; "I haven't found anyone that can give me a yes or no on this one so maybe you can help me. Here is a story and then the question; " I leave the bait shop with a quart of shiners in a bag of water. I head to a lake and pump my live well full of lake water and put my minnows into the live well. At the end of the day I have some minnows left. I was prepared, and in the truck I have brought 3 gallons of well water and a 5 gallon aerated minnow bucket. I put the aerated bucket in the boat and fill it with the well water. I plug the aerator into the cigarette lighter in the boat. I scoop the minnows out of the live well into the bucket. I drain all the live wells and pull the drain plug. The question now comes up: Am I ready to travel or do I have to take the bucket with the minnows and well water out of the boat before I can leave the landing? Answer, You must remove all of the water from the boat. Containers with fresh water must be kept in the vehicle. Click here for the full story >> Keeping Live Bait Alive, Legally! Fishing Report May 14, 2012 Jeff Sundin - West winds and warm temperatures perked up the Walleye action on Sunday. On Lake Winnie, the jig and minnow bite was on, as it was on Leech Lake where only a day earlier, the Walleye acted like all they wanted to do was take a nap. When we arrived at Winnibigosh, the surface water was at about 56 degrees, the skies were mixed and the breeze was already blowing at about 15 MPH. During the first couple of hours, fishing started slow, in spite of what seemed to be ideal conditions. As the morning chill wore off and wind kicked up some whitecaps, the Walleye turned on and by around noon, there was a full-scale action bite going on. Our best fishing was in 8 feet of water using a 1/8 ounce jig and minnow, mainly Shiners, but provided that they were large enough, we caught fish on Fatheads too. There are tons of minnows in the shallow water right now, so I think you can plan on the jig & minnow presentation to hold up for a while. You'll be able to find a full scale Lake Winnie and Cutfoot Sioux report on Tuesday morning. (5/14) An email from Jim Jurvelin; "I found your article on how to keep your live bait after a day on the water to be very informative. I would like to do the same,but have a couple of questions". How do you mount the aerator tubes so you can close the cooler lid without crushing the tubes? What is the make of the coolers you are using? Does the cold well water that you keep in the truck shock the leeches or minnows after going from water that maybe a lot warmer after a day of fishing ? You mentioned aerating the cooler in the truck. Do you plug it into a cigarette lighter and if so does it drain your battery or do you have a separte deep cycle battery in the back of your truck just for the aerator? A) Jim, There's no problem shutting the lid, I drill a 1/4 inch hole near the top of the cooler which allows me to run the tubing inside the cooler just under the lid. The cooler that I'm using now is a Rubbermaid, 10 Gallon beverage cooler. You could use a smaller one, but I like to have lots of room for extra minnows, especially later in the summer when we use Redtails and Creek Chubs. In spite of the fact that this cooler has a screw on lid, you'll need to whip up a gasket that fits tight to the lid, this will prevent water from splashing out on a rough boat ride. The alternative would be to go with a more expensive cooler that has a tighter latching system. Temperature shock isn't a problem because the water in the boat is kept amazingly cool during the day. I've been holding my minnows this way for several years now and my fishing customers and DNR CO's have been amazed by how well the water temperature is controlled. Take it a step further, even if I loose a few, it's still better than losing all of them. One of the 12 volt batteries from my ice fishing flasher runs the pump for a couple of days. They have a very, very low current draw. You could easily hard wire one in the truck if you wanted to, but it's really not necessary. (5/14) Zach Dagel, Grand Rapids Guide Service. Fishing on Winnibigoshish was good for Zach on Sunday too and he picked up some info about Leech Lake too >>> Read Zach Dagel's Fishing Report here. (5/14) On Ball Club Lake, Gus' Place Resort. Gus says; Happy day! Lake surface temperature is 56! Water clarity is stained due to the large volume of Mississippi river water entering the lake. Although I haven't seen limits of any one species in the live wells; all fishermen are bringing in fish, good mixed creels; Walleye, Perch, Crappie & Northerns. Everyone is catching fish. Work slip bobbers and jigs with Shiners or leeches in 4-10 feet on the South end of the lake along the east shore and at the mouth of the Ball Club River. Down-size to Fat Head minnows for the Crappie, wish are now moving in and out of the shore line weeds. Fishing Report May 13, 2012 Jeff Sundin - The Weather for the Walleye fishing opener couldn't have been better! Bright sunshine, a Westerly breeze and gently rising water temperatures. My long time fishing buddy Tim Higgins joined me on Leech Lake where we spent most of our day, looking for a "hot bite" that never materialized. Instead, fish would come in sputters and spurts. Not that it was a bad day, it was really pleasant and almost everyone on the lake was catching at least some fish, it just wasn't reved up to high gear either. Surface temperatures were about 56 degrees whan we arrived and by days end, I was seeing readings up to about 58 degrees. The sunshine is predicted to continue for the next couple of days, so I'd expect to see temps reach the 60 degree mark early this week. Traffic on the lake was moderate, crowds of 20 to 30 boats were gathered on the more popular spots. From what we saw, boating manners on the lake were really, really good. With just enough wind for a drift, most everyone found a little stretch of territory to fish with tripping over each other. Our best fishing came from areas with shallow sand and light weeds. Baitfish, probably Shiners were on the shallow breakline in water depths of 7 to 9 feet. Scattered, small pods of Walleye were mixed in the same areas. The fish were biting light and we missed more than we hooked, but we did manage to get hooks into some of them. Sizes varied, we caught a handful of "slot fish" ranging from 20 to 26 inches, some keepers and a couple little guys too. Fishing with 1/8 or 1/16 ounce jigs, we discovered that for us, Fatheads worked just as well for Walleye as did the Shiners. In fact, we caught all of the largest fish on Fatheads. (5/13) On Lake Winnie: Just accross the highway, anglers on Lake Winnibigosh were reporting similar experiences. Almost everyone on the lake was catching fish, finding them in scattered, small groups. Judging by reports, heavy traffic probably encouraged fish to scatter even more. With light wind and bright sun, fish would bite whenever they were first discovered, but after a couple of passes, fish would disperse. According to Joe Thompson, Four Seasons Resort the fish were tricky to pattern. Some were caught in shallow water, 6 to 8 feet, while others were caught out on deeper flats in the 10 t0 12 foot range. Joe said that their best action occured early in the day, before bright skies and heavy traffic had a chance to make fish spooky. (5/13) Zach Dagel, Grand Rapids Guide Service. Delivered the best fishing report that I heard all day long. He and some friends had a great morning fishing for Walleyes in their waders. In recent years, water flow at the Winnie Dam has been too low to produce the really good current that's needed to attract numbers of Walleye. Finally, shoreline anglers have good water conditions and it paid off yesterday. Waders on, Zach and his buddies hit the water early in the morning and by the time I talked to him at about 11:00 AM, they'd already caught dozens of fish. (5/13) What about Crappie Fishing : Yes, remember the old addage; if the Lilacs are blooming, the Crappies are biting? Well, guess what? The Lilacs are blooming and .... I think you better get out there. Good Crappie fishing is taking place right now, male fish are dark black and gathered in shallow weeds near spawning habitat. Bulrush with mixed sand/marl bottom in 2 to 5 feet of water are ideal. Same thing goes for you Bluegill fishermen, panfish are getting interested in the shallow bays and with 60 surface temps, spawning activitiy will start up really soon. Fishing Report May 12, 2012 Jeff Sundin - Hey! Good Morning. :)!! It's the opening day of fishing! Right now, there's not a cloud in the sky and the air is calm, we're gonna get a tan today! Check in tonight to find out how the opening day action is. (5/12) Just for fun, WDIO TV has posted some fishing tips and strategies we've talked about this week. Just hit the link and click on the fishing tips on WDIO's web page, take a peek and tuck a few ideas under your hat for the next trip. (5/11) Zach Dagel, Grand Rapids Guide Service. Went out with the kids for a quick trip to find some panfish. Zach said that the water temperature had risen to 63 degrees in one of Pokegama's shallow bays. The entertainment was good! Maybe there weren't too many giants, but the Sunfish action was good and the kids were smiling. >> Read Grand Rapids Fishing Report . (5/11) I got a note from my fishing buddy, Pradco's Jon Thelen announcing a new project. In Jon's words, (this is); "to announce the launch of a new project that I am working on with the PRADCO-Fishing brands. Beginning this week, I will be shooting a weekly Internet based show which will take me across the Midwest chasing some of the best bites our fisheries have to offer. "This Week On The Water" will be a cross between the most current information and a "how to" format all packed into about eight minutes! Upon shooting each week, the show will be edited and posted within just days on various fishing based websites, placing it amongst the most current information available". Luckily, you don't have to wait to see the first episode, it's already here! Click here to view >> This Week In Fishing. (5/10) Bemidji Lakes Area, Paul A. Nelson, Bemidji Area Lakes Guide Service says; "The walleye opener in Minnesota is only days away, with the season opening at 12:01 am on May 12th. Surface water temperatures in most of the lakes in the Bemidji area are in the low to mid 50s, which is a little warmer than usual for the opener. The walleyes should be biting when the season opens, especially if the weather cooperates. Walleyes in the larger lakes like Bemidji, Cass, Leech, Lake of the Woods, Upper Red and Lake Winnibigoshish should mostly be using shoreline structure. Any shallow areas with emerging cabbage weeds or hard bottomed areas with some rock are usually potential feeding areas for walleyes early in the season. Post spawn walleyes will begin searching for schools of pre-spawn spot tail shiners or the schools of smaller perch as their primary forage once they recover from the spawn. Many walleye anglers use jigs and minnows early in the season, with a 1/16 ounce Fireball jig fished on 5 or 6 pound test Bionic line a good combination for most situations. Generally speaking, walleyes in most large lakes usually show a preference for spot tail shiners or emerald shiners over other types of minnows, because they are their natural forage. Walleyes in many smaller lakes often don’t have as many shiners to feed on, so the walleyes aren’t as fussy about what type of minnow they eat, with fatheads and chubs working just as well as shiners. Leeches may also be good on the opener with the warmer water. Walleye anglers learn early to bring with a variety of baits. Walleyes are notoriously fussy, so anglers need to have several presentations ready, in case “Plan A” or even “Plan B” doesn’t work. Fishing Report May 10, 2012 Jeff Sundin - I'm back home after spending a glorious day and a half with my daughter, Katie at Lund Boat's photo shoot. Thanks to everyone at Lund, all of the fishing pro's and to the world's greatest photographers for welcoming us into the family. Oh and by the way, thanks to Katie for letting me tag along! In about 48 hours, I'll be pulling up the driveway, getting ready to head out to the lake. I have a special treat planned for opening day, so with a little luck, I'll find a way to get creative and come up with a really interesting report for Sunday morning. Before I load the boat, there are still a few special appearances on the schedule. This morning at 8:10 AM I'll be heading into the KAXE Studio for a live broadcast from 8:10 AM to 9:00 AM. We'll be interviewing the DNR's Regional Fisheries Manager, Tim Goeman and my good pal from Lake Vermillion, Billy Rosner. We'll get their outlook about the Walleye opener and share a couple of stories from the lake. It's a call in program, so if there's something on your mind, dial us up! Later today, the News Crew from WDIO TV, 10/13 Duluth was in the neighborhood and we spent time together taping some segments for their fishing opener segments. They started running the programs on Wednrsday and they'll be running more today in both the 6:00 and 10:00 PM broadcasts. On Friday, I'll be live on location in Grand Rapids and I promise to have all of the details about that, later today. Fishing Report May 8, 2012 Jeff Sundin - Okay, here we go! For me, the whirlwind is gaining strength as we head into the home stretch. For the next few days, life is going to be a little hectic around here. A lot of it will be about cameras and microphones, with a few, nice big smiles thrown in for good measure. Today marks the official start of the summer fishing season on the Lindy Audio Fishing Report section. From here on, expect an update every Tuesday and Thursday. The reports are usually updated by around 8:30 AM. If you're within broadcast range, the News Crew from WDIO TV, 10/13 Duluth is heading over later this morning and we'll be taping some segments for tonight's broadcast. After that, I'll be packing up the truck, grabbing my daughter Katie and heading for the Lund Boats Photo Shoot at their top secret location. Hopefully the weather will be good and we'll get a few pictures taken before we head back home tomorrow. Oh, just in case you never found a copy of the 2011 catalog, Katie was in it! On Thursday morning, I'll be heading into the KAXE Studio for a live broadcast from 8:00 AM to 9:00 AM. We'll be interviewing the DNR's Regional Fisheries Manager, Tim Goeman and my good pal from Lake Vermillion, Billy Rosner to get his outlook about the Walleye opener. It's a call in program, so if there's something on your mind, dial us up! On Friday, I'll be on locatiion in Grand Rapids and I promise to have all of the details about that, later today. It's going to be a busy few days, but never too busy for a smile and a chat, so if you catch us cruising around, be sure to say hi! Fishing Report May 7, 2012 Jeff Sundin - Five Days ..... Did you remember your boat batteries? If they're not holding a full charge, replace 'em now and get it over with. Oh and by the way, you haven't forgotten that you'll need to be sure that you have a system to keep some fresh water on hand for transporting your bait, right? Learn more about >> Keeping Your Bait Alive Legally. Okay, and did you get your fishing license? I just clicked this link and bought all of my Minnesota Licenses and State Stamps for the whole year. While I was at it, I printed off a few extra copies, one for the tackle box, one for the boat another for the truck, you know just to be sure that I don't get caught short. Please, if you love Walleyes, add the voluntary Walleye Stamp, it really will help! After a rainy, gloomy weekend, I just got done walking through the most incredible Moonset and Sunrise that I've seen in a long time. Oh, don't worry, if you know where to look, you'll be seeing plenty of pictures. Hey, in fact if you want to, I think you might be able to see one of these pictures every single minute of every single day! Okay, folks are busy getting ready for the opener right now, but indications from everyone around the Itasca area are pointing toward a great opening weekend. If you happen to have a copy of the Minneapolis Tribune from yesterday (Sunday) you can check out Dennis Anderson's column for some fishing predictions including some ffrom my buddy Tom Neustrom and even a comment or two from me. While you're at it, check out Sam Cook's column in the Duluth News Tribune, we both added our two cents worth and my pal Billy Rsoner is there too! (5/7) Hot Tip Puts More Walleyes In Your Boat! Just for fun, take the next 59 seconds and learn from my mistake. Even when you try, things don't always go the way you plan. Lots of my fishing buddies have already seen me make this mistake and now we got it on film so everyone can learn to be more effective with a jig and minnow. Oh yeah, go ahead and laugh, get it out of your system ...... :)!! Watch >> Walleye Jigging Video. May 7, 2012 - On Lake Winnie, everything looks a little quiet right now out on the big lake. A tour along the sleepy looking shoreline of Bowen's Flats on Saturday reminded me of those times that you're getting that last few minutes of peaceful sleep before the alarm goes off and everything errupts into a hectic day. At this time next week, the Bowen Lodge Walleye fishing report is going to be jammed with information about the big lake and Cutfoot Sioux. (5/7) Zach Dagel, Grand Rapids Guide Service. Went out for a quick trip to find some panfish on Sunday evening. Zach said that the water temperature was holding at 55 degrees, down from 57-58 degrees a couple of days ago. Without a lot of time to spend, they had to hurry their search, but they were lucky to find >> Read Grand Rapids Fishing Report . (5/7) Ryan Peterson checked in with a quick report; "The outlook for opener looks good, bait supplies seem to be plentiful around the Grand Rapids, Deer River area, the folks fishing panfish are coming in with good reports, and water temps have been rising. As always on opener it will be another good jig and shiner bite. Open dates for great fishing still available!" Contact >> Ryan Peterson's Guiding . (5/7) On Bowstring Lake, Erin at Geiger's Trails End Resort was pretty chipper about the nice sunrise this morning too. She said; "Oh what a BEAUTIFUL morning to get that last bit of Spring Crappie fishing in. The water has a gentle drift in it coming from the Southwest. Before the rains, Bowstring Crappies and Perch had begun to move into shallow water in Cow Bay, Muskrat Bay and up in the area of the bridge. Now that the sun is back, water should warm and the panfish will be heding back toward the shallows. Fishing with small jigs tipped with medium size fatheads and suspended a couple of feet below a bobber are best. If you're out there, Trails End is open to the public and they sell bait, gas, and snacks. Erin is also an avid photographer who would love to capture a picture of your trophy. >> Geiger's Trails End Resort . (5/7) From The Iron Range, Greg Clusiau is primed and ready for the fishing opener. The only question is; What is he going to do? With everything from Walleye to Brown Trout on the menu, Greg is having some indecision. Why don't you check in and help him out? >> Read Iron Range Fishing Report . (5/7) From the Bemidji Area, Matt Breuer, Northcountry Guide Service; " As we move toward opener all hands are on deck. People are rigging their boats like mad, and I see people filling the lots at the local bait shops and sporting goods stores. Walleyes should not sway much from openers past in our area, despite the odd spring we’ve had. Look for that 9-11’ of water on sand flats or areas with good early weed growth. Pitching a spottail shiner on a Lindy jig in pink, blue, or chartreuse is a surefire way to put fish in the boat. Fish should be active, so keep on the move until you find a pocket of fish, and then hover on ‘em. Lakes like Bemidji, Plantagenette, Turtle, Turtle River, Cass, Kitchi, and Andrusia should all be busy and decent this opener. Crappies in the area are officially up shallow. Anywhere from 1-5’ of water in mucky bays or 5-11’ of water near new weed groth. Look for nice stalks of cabbage or new growth lily pads. Fuzz-E-Grubs and Little Nippers below a float with a crappie minnow still out-fishes everything else. The bluegills are even starting to show their faces, which is a good sign that things are progressing. Water temperatures range from 53-57 in our area. Morel season is also underway, and it’s been a great year so far. Our crew has picked over 12lbs. of the tasty morsels in the last week. A great side-dish to go with your crappie fillets. We have some openings for guide trips starting the week after walleye/pike opener. Give us a call or shoot us an e-mail for availability! Take care, Matthew J. Breuer, Northcountry Guide Service . Fishing Report May 6, 2012 Jeff Sundin - One week to go before the Walleye Fishing Opener and conditions are shaping up fairly well in the Itasca Area. Water temperatures are holding steady in the mid to high 50 degree range and water levels are looking good. On the Mississippi River, water is rising and as of Saturday, there is plenty of fishable water at the Winnie Dam. In fact, it looks higher than I've seen it for a few years and I'll bet this is going to be great news for the wader fishermen. (5/5) Surface water temperatures are solidly into the high fifty degree range on most lakes and yesterday, I heard a second hand report of a 60 degree surface reading. Our recent spell of warm weather is giving way to a period of rain, but predictions are for moderate temperatures. Predictions for the opener? My educated guess is that we'll see above average action on some lakes that are not typically "hot" opening day lakes. An early spawn has given some of the Walleyes a better chance of recovering. Looking for an easy meal, they'll be roaming the flats in search of minnows, like the Spot Tail Shiners which are just beginning to run and will probably peak about a week earlier than usual this season. On traditionally good opening lakes like Winnibigoshish, I think there will be a better chance of finding fish already broken up into smaller schools. There will always be a few locations where large schools of fish attract big crowds, but for anglers who like to roam away from the pack, there will be a few extra spots where early arriving packs of Walleyes have moved in. Don't expect too many really radical differences though, in spite of what started off to be a really early spring, nature has figured out a way to put us back on a more typical path. Based on the tree blossoms, water temperatures and other observations, we're a week to ten days ahead of schedule at the most. (5/5) It is official; Minnesota Governor, Mark Dayton has signed both of the bills that we've been following for most of the past few months. The "Fish and Game Bill" HF 2171 and the Environment Policy Bill HF2164. What that means for every minnesota boater is that as of Friday, those AIS Decals that we've been talking about for a month now, WILL NOT be required for the 2012 fishing season. I am going to save mine and get it autographed. Someday when my grandchildren find it in my scrapbook, it will give me an excuse to go off on a rant about how the legislature and the DNR can team up to wast giant piles of money! Oh, and by the way, for anyone from the either the legislature or the DNR who might actually be listening; Now that we all got behind you and HELPED YOU get the the license fee increases passed, do you think that maybe we could try working together to prevent this kind of stupid stuff from happening in the future? Don't worry, there's still gonna be a sticker, the next one is gonna be your reward for taking a test. The test is your reward for first taking a class and the class is your reward for electing people who are really just throwing darts at the wall, hoping to stumble into ways of solving these problems. That's just my two cents, I could be wrong. Fishing Report May 5, 2012 Jeff Sundin - One week to go before the Walleye Fishing Opener and conditions are shaping up fairly well in the Itasca Area. (5/5) In Grand Rapids, Zach Dagel, Grand Rapids Guide Service checked in with some news. The West End Bait Shop, formerly owned by our friend Mark Miner, has been sold to the company, "Little Stores". We'll be hearing more about the transition early this week. Spot Tail Shiners are going to be plentiful for anglers in Grand Rapids next weekend. Zach stopped in to visit Ben Kellin, Ben's Bait and learned that ... Read >> Grand Rapids Fishing Report Here. (5/5) On Bowstring Lake, Erin at Geiger's Trails End Resort says; "There is nothing better than being on the dock, in a t-shirt, looking over the docks and boat lifts, waiting to see them filled on the fishing opener!" Erin said that it's been a bit breezy on Bowstring Lake these days, but warm temperatures have helped with the effort to get everything ready for the opener. Fishing Report May 4, 2012 Jeff Sundin - For the past few weeks, there's been a lot of attention paid to things that fishermen don't like to think about. Politics, regulations, ... you know stuff that makes you want to roll over and go back to bed. Well, here's the good news then! One more short week to go, and then we'll be talking about the arrival of the Minnesota Fishing Opener. After that, for the rest of the summer, there's nothing on the agenda except fishing! (5/4) On Thursday evening, I got word that the Governor has signed both of the bills that we've been following for most of the past few months. The "Fish and Game Bill" HF 2171 and the Environment Policy Bill HF2164. Just to be that I don't jump the gun, I checked the hotlist this morning and they don't list either bill as being signed yet. Maybe they just haven't updated the website or maybe he didn't actually sign them? I just want to be sure before I go overboard. If they are signed, then here's what that means for us; Those AIS Decals that we've been talking about WILL NOT be required for the 2012 fishing season. After that, everything else that passes in those two bills will take effect either next year or even later. We'll have plenty of time to talk about that as the stories unfold. (5/4) Shiners, Fatheads and other wiggly things. Following the bait supply in the Deer River area got easier today. I just got off the phone with Bill Powell from Fred's Bait. After a slow, but steady week last week, the Spot Tail Shiners really started running over the past couple of days. Acoording to Bill; "Fred's Bait has more than enough Shiners to last through the fishing opener weekend. The only thing I have to worry about now is a power shortage or some disaster"
That's one of the hard parts about the bait business, if you don't have enough, you worry about getting more and if you have too many, you worry about keeping them alive. The supply of Fatheads, Rainbows and Leeches looks good too, so anglers, at least in the Deer River area can rest assured that there will be bait next weekend. (5/4) Crappie and Bluegills are beginning to slip into some of their shallow water, spring hideouts and anglers with the itch, are finding some cooperative fish. On some of the smaller lakes, surface temperatures in the 56 to 59 degree range are being reported. Crappies, Sunfish and Perch are getting more interested in moving toward inlets, small bays and shallow weed flats. Right now, it's still a lake by lake proposition and shorline anglers who cover a lot of ground, find that about every third lake pays off. On Thursday evening, I was waiting out the sunset on a tiny lake and as I waited, I could see fish swirling in the shallow weeds about 30 feet off shore. I didn't have a fishing rod along, but if I had, I think some really serious multi-tasking could have gone on! For now, walking in to your spot is probably better than taking the boat. Panfish are still flighty and unless you're really stealthy, your chances of "spooking" the fish are a lot lower on foot. According to Greg Clusiau; "The shallow water Crappie action has been hit and miss, but roaming the shallows in waders has worked well at times". (5/4) Hot Walleye Tip! Over the past few days, I've been getting some calls from writers asking for the perennial "hot tips" for the upcoming Walleye fishing opener. I don't think that it's too hard to find guys to let you in on the little secret about using "light jigs in shallow water" or "following the baitfish" to find Walleye. There are some things will are absolutely guaranteed to help you catch more Walleyes and here's one of them; Pay attention to your boat control! All of the best bait, rods and tackle in the world are worthless if you don't keep your boat near the fish. In fact, good Walleye anglers fish with their boat and then just train the lures to tag along. (5/4) Boat Control Video; Okay Guess What? I spent a lot of time this spring, tagging along with Jon Thelen. We worked on a whole bunch of really cool, special projects and some of them are starting to show up around the internet. I'll be adding links to a lot of them, but this is one that you need to see right now. In a little over a week, you're gonna be out on the water trying to bag some walleyes. Keeping your boat on the fish makes that a lot easier and getting good with a drift sock is a perfect way to improve your boat control. Watch this short video and you're going to pick up a few tips that will definitely help! Click >> Drift Control Video. (5/4) On my KAXE radio program Thursday morning, I was asked for a couple of fishing rod recommendations for someone who wanted a good quality, light rod for fishing the early season shallow water patterns. Here are a few choices that I spied during the sportshow season this winter. TFO Rods (Temple Fork Rods) is producing an excellent line of rods that are affordable priced. Designed for TFO by the legendar rod designer/builder Gary Loomis, these rods have everything I need to present the bait and catch the fish. For jigging, look at their Tactical Series, GTS DSS 632-1 and for a good looking, jigging/rigging combo rod, I think the GTS DSS 692-1 will fill the bill really nicely. St. Croix Rods has come out with an affordable series of light rods too and I already picked up one of these for myself. Lighter than average for most Walleye fishermen, but just the way I like 'em for shallow water fishing. The PFS70LXF is part of their Panfish Series and paired up with a 1000 or 1500 size reel, spooled with 4 pound test mono, this rod is going to be absolutely wonderful for fishing 1/16 and 1/8 ounce jigs on those shallow sand flats. My fishing buddy, Matt Mattson already picked up one of these for himself and has been on the water using it for Crappies. He called just last night and gave this rod a glowing thumbs up! Fishing Report May 3, 2012 Jeff Sundin - We're heading into the home stretch toward the 2012 Minnesota Walleye Fishing Opener. The weather is on track to provide what I think should shape up to be an above average opening weekend. The relatively early spawning and warming water temperatures combined, should encourage larger female fish to recover early enough to give fishermen a chance at some larger fish on the opener this year. It wouldn't surprise me to learn that Walleye locations are a bit more varied for the opener too. Instead of finding one or two key locations, it's possible that we'll find smaller schools of fish, spread out over a wider range. Smaller, male fish should be in full scale feeding mode and locating schools of baitfish will be a key to locating feeding fish. On larger lakes like Leech Lake, Winnibigoshish and Upper Red, Shiner runs will be at, or close to peak during the first week of the season, so there will certainly be a shallow water bite on these lakes. It doesn't have to be a big lake, any lake with shallow, sandy flats that contain Shiners or Perch will have a similar pattern. On smaller lakes with stocked populations of Walleye, concentrate your early efforts on any area with emerging weeds. Bulrush patches, Coontail, Cabbage, even Sandgrass will hold baitfish and hungry Walleyes. (5/3) For many Minnesota Walleye Fishermen, Spottail Shiners are worth their weight in Gold on the Walleye Opener. No one wants to throw 'em away, but now that every single drop of water that's in your boat needs to disappear before you leave the landing site, it's going to be important to learn a few things about keeping your live bait fresh. Doing it without winding up on the side of the road, pulled over by your local Conservation Officer, is the trick. I'm gonna keep my minnows alive, healthy and in full fish catching mode all summer long and you can do it too. Just read this article >> Keeping Live Bait Alive, Minnesota Legal. (5/3) On Lake Vermillion, my pal Matt Mattson slipped out on Wednesday evening to find some Crappies. They found surface temperatures ranging from 57 to 59 degrees. After poking around for a while, he found some fish in shallow water, 2 to 3 feet deep on a weedy shoreline. Matt said that the fish were spooky, but they did sit still well enough to provide a little action. Using small tube jigs, tipped with Crappie minnows, they used bobbers to keep the bait about 14 inches below the surface. (5/3) Walleye Anglers In the Duluth Area will be interested in this note I got from my friend Gene Shaw. "The Twin Ports Walleye Association (TPWA) will be hosting its 3rd Annual Walleye Fishing Tournament on the St. Louis River May 19-20, 2012. The tournament will start and culminate at Rice’s Point public boat access located on Garfield Avenue under the Blatnik Bridge. The field of 50 boats with 100 fishermen/women has been filled. The TPWA is looking forward to another exciting tournament this year. This tournament is a catch-photo-release tournament with 100% of the fish released. Twelve sponsors have contributed to this year’s pay out, in cash and prizes, valued at over $11500. This year, a portion of the proceeds will be donated to the Veterans of Foreign Wars Post 137 in support of their youth activities program. The TPWA is made up of walleye anglers, both men and women, who share their enthusiasm for recreational as well as competitive walleye fishing in and around the Twin Ports (Duluth, MN and Superior, WI). The association’s main focuses are education and protection of our fishing resources. In addition, the TPWA promotes ethical, safe and enjoyment for the sport of walleye fishing. The TPWA has partnered with other local organizations such as Take a Kid Fishing, Courage Center Duluth, VFW Post 137 and the Duluth areas Fishery Biologist supporting their cleanup efforts. Fishing Report May 2, 2012 Jeff Sundin - What? you've gotta be kidding me! The AIS (Aquatic Invasive Species) Decals are back in the news. ATTENTION BOATERS!, here comes another head scratcher. You're never going to believe this, but the new AIS Decals that we've all been scrambling around to find, may already be obsolete. Yes, even before most folks have put their boats in the water, we're getting word that there's a new AIS program on the horizon. The new bill, if passed, will require boaters to take an AIS Test in order to obtain a new decal. A quote attributed to Steve Hirsch, Director of the MN DNR Ecological Services Division; "The current bill would repeal the existing sticker requirement. We didn’t want to require two stickers. We plan on getting the word out once the bill is signed". The legislation is included in the Omnibus Environment Policy Bill #2164. The bill has already passed in both houses and requires only the Governor's signature to become law. I had a conversation with Luke Skinner, from the MN DNR this morning and he said that they believe that the bill will be signed either today or tomorrow. Skinner verified that if signed, the current requirement for the AIS Decals will be repealed. A new version of the decal would be earned by Minnesota boaters who complete an online class and take a test. If signed, the new regulation would take effect in 2015 and the current AIS Decals will not be required for the upcoming season. If the Governor doesn't sign the bill, then the current law would remain in effect and the current version of the decals would still be required. We'll know the final answer soon, probably tomorrow, so stay tuned. (5/2) More than ever before, Minnesota anglers will feel the impact of new rules aimed at slowing the spread of Aquatic Invasive Species. There's good news though, life on the other side of an adjustment period will be even better than it was before. All anglers will need to do, will be to change a few habits and soon, they'll see how easy it is to have a bait supply that's in better shape than it ever has been. (5/2) Getting set for the opener. Everyone needs a fishing license and if you want to save yourself a long wait in line at the bait shop, do like I do and get your license right now, on the internet. It only takes a few minutes and in one session, I can get all of the Minnesota State Licenses and Stamps that I need for the entire year. Here' I'll make it even easier, just click this link >> Buy MN Fishing License Here . And remember, please, if you're a fan of Walleyes and Walleye fishing, add the Walleye Stamp! (5/2) Deer River Area Bait Supplies are looking "fair" according to Bill Powell of Fred's Bait Shop. On Tuesday, Bill said that he's been catching some Spot Tail Shiners on most outings, but so far, he couldn't say that "the run was on". Rainbow Chubs are in good supply this spring. During our early warm spell, the Rainbows ran like crazy for a while and the bait trappers did a good job of stocking up on their inventory. (5/2) Bemidji Lakes Area, Paul A. Nelson, Bemidji Area Lakes Guide Service says; Surface water temperatures in the Bemidji area are slowly rising, with most lakes in the low to mid 50s. There still hasn’t been that break-out weather wise, with daily high temperatures staying on the cool side. What has been helping the water temperatures increase in the lakes is the overnight temperatures haven’t been as cold, so there isn’t as big a setback each night. The walleye opener is coming up fast. Anglers have been getting more serious about getting their boats and gear ready for open water. The docks are in at most of the public accesses, so anglers are able to get on the water for a test run or to do a little fishing for crappies, sunfish or perch. 2011 Minnesota fishing licenses have expired, so anglers will need to purchase a 2012 Minnesota fishing license before they can go fishing. Anglers are encouraged to consider purchasing an optional walleye stamp when they purchase their fishing licenses. The funds raised by the walleye stamps are strictly earmarked for stocking more walleyes into Minnesota lakes. It gives walleye anglers the chance to say they are part of the solution when it comes to improving walleye fishing in Minnesota. Anglers are finding crappies moving into the shallows in many lakes. The best activity has usually been later in the day, after the sun has had a chance to warm the water. Crappies move into the shallows to feed at this point in the season, with bass crappies and sunfish usually spawning when water temperatures reach between 68 and 72 degrees. Crappie anglers can learn to guess if crappies are male or female in the spring, so they can practice some selective harvest and let some of the big females go. Male crappies are much darker, with dark scales on their cheek plates and heavier black spots down their sides that continue all the way to the bottom of the fish. Female crappies on the other hand have light colored cheek plates and their black spots are less dense, especially towards the bottom of the fish. - Paul A. Nelson Bemidji Area Lakes Guide Service . Fishing Report May 1, 2012 Jeff Sundin - Note: This is the first version of the summer page for 2012. It's going to take me a while to get some of the bugs worked out, so I'll be adding information to it throughout the day. If you have trouble finding something that was in a recent report, click here to view the April Fishing Archives or if you stumble into something that doesn't work correctly, please email me. Well Okay Then! Here we are, May 1st and with only 11 days remaining before the 2012 Walleye Fishing Season opens, the hustle and bustle around Grand Rapids and Deer River is getting noticable. Most of the resorters, bait suppliers and tackle shops are working at a fever pitch, getting things ready for the crowds that will begin arriving in just about a week. While all of that is going on, panfish are beginning to slip into some of their shallow water, spring hideouts and anglers with the itch, are finding some cooperative fish. On some of the smaller lakes, surface temperatures in the low to mid 50 degree range are being reported. Crappies, Sunfish and Perch are getting more interested in moving toward inlets, small bays and creeks. For now, walking in to your spot is probably better than taking the boat. Panfish are still flighty and unless you're really stealthy, your chances of "spooking" the fish are a lot lower on foot. (5/1/12) On a small, Deer River Area Lake, Brian Castellano, Deer River, MN broke out the chest waders and hit a small lake on Sunday evening. While he was there, Brian found a good bluegill bite up shallow. Brian said; "While the size was average I'd say, the numbers made up for it. The fish were anywhere from 6" of water out to a couple of feet. Bobber fishing w/ a small jig head and Exude mayfly nymph caught fish, but the bigger gills came on the smallest sized Yo Zuri Snap Bean crankbait." Brian made a special point of saying; "Thank You to Greg Clusiau for telling my about this little bait". Brian was hoping for a run of Crappies to move in at sunset, but they didn't, at least not in that location. There was a bonus though, on the trek, he discovered a nice looking spot to return during the bow hunting season. So it was a nice evening all the way around. (5/1) On Ball Club Lake, Gus' Place Resort. Gus hasn't had much time for fishing. Getting the resort ready for the early season traffic has been the top priority. But, there is some good news; Thanks to recent snow and rain, Gus said that the lake level is on the rise toward normal levels. He added; "All indications are that the early "ice-off" should warm the lake up ahead of a normal Spring, fish will become more active than normal for this time of year". Gus is optimistic that it will be a good opener this season. We just had a group up over the weekend and they cought a bunch of nice perch. Good on Winnie on Friday. then the wind howled on Saturday, but they caught a bunch on Cutfoot...out of the wind! Pretty cool. We expect a great opener on Winnie and Cutfoot. And Eagle Nest Lodge still has a few openings. (5/1) In the Grand Rapids Area Zach Dagel checked in with some news about his new line of Zach Dagel Planer Boards. According to Zach, there a five sizes to suit almost every fishing situation. (5/1) On Cutfoot Sioux , Bryan Harris at Eagle Nest Lodge told me that they've already had some guests at the resort. Early spring Perch fishing was the goal of his crew last weekend and they had a great time. On Friday, they caugh Perch out on Lake Winnie, but Saturday's gusty winds forced them to stay in Cutfoot. It didn't matter though, they caught plenty of Perch in Cutfoot too. Advertise Here! Expanded Itasca Area Fishing Reports. Since mid-summer 2010, I've really made an effort to expand my area fishing reports. My goal has been to give anglers who are surfing the web, one fishing report that's always up to date and well written. Now I want to expand the reports section even more and I'd like you to participate. Lodging, Bait & tackle suppliers, guides or any other fishing and hunting related business can find a way to take advantage of the offer. For more information about contributing, sponsoring or advertising. Email Me .